Chicago Loud 9 maintains a busy performance schedule, recently landing a residency at Rhyme or Reason in Wicker Park. 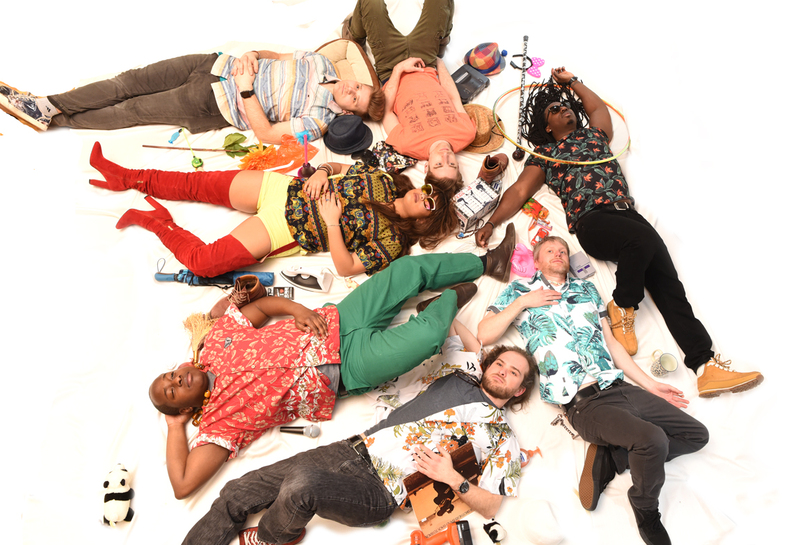 Drawing from influences such as Earth, Wind, & Fire, Outkast, Bob Marley, The Roots, Red Hot Chili Peppers, and Beyoncé, Chicago Loud 9 is a unique blend of R&B, Rock, Hip Hop, Jazz, and Reggae that leaves the crowd feeling “they are left on cLOUD9!” Chicago Loud 9 has released 3 projects and is gearing up to release their 4th LP in the Summer of 2018. Dhan Dee has been a lifelong Poet and Writer. Dhan is an emcee who originally hails from Chicago’s west side and then the lower north side respectively. He recorded his first song at 14 and has been going full speed ahead since then. Before Dhan was frontman of Chicago Loud 9, he was in Hip Hop supergroup A-Team on S.K.Y Entertainment. His Motivation of wanting to have a live band came from seeing the Roots live and in person in 2007. Outside of music Dhan is a personal trainer for Chicago Fit 4 Life who puts on the No Excuses Fitness Bootcamp, which is the largest fitness bootcamp in the city of Chicago. Aya, aka Blazian sensation, aka the Blackanese one, aka Harmony of Colors, is a Japanese & Black American singer and songwriter born in Tokyo and raised in the Midwest. As her passion in life has always been singing, she sang with Indiana’s state champion show & concert choirs, her school gospel choir, started her own bands in both high school and college, and sang with multiple a cappella groups at her university. After graduating from the University of Chicago in 2014 with two degrees, neither of which have anything to do with music, she decided to pursue a career in music. In September of that year, Aya joined Chicago Loud 9 as their new lead vocalist. Her diverse background in music is a great fit for the group and the talent of the musicians motivated her to write original tunes and to continue on her path towards becoming a full-time performer. She is also starting to use her Japanese and Spanish language skills in her songwriting and hopes to bring a distinct touch to contemporary music by weaving together influences from different cultures. Chad Wynes was one of the many people who felt a deep connection to the Grunge sound of the early 90’s and he immediately felt the need to pick up a guitar and join the movement. He formed his first band in 1995 in his hometown of Silvis, Illinois and has continued to perform ever since. Chad ultimately decided to pursue a full time music career and set off for Chicago in 2002. He spent the next 10 years performing original live music in Chicago while being exposed to many new influences and other like-minded musicians. He became a founding member of Chicago Loud 9 in 2012 and, outside of the band, he enjoys producing hip-hop and electronic music and running his own graphic design company. Like most prospective drummers, Kyle discovered his passion at a young age – by making drum sets out of pots and pans in the kitchen. Growing up in Indianapolis, he was fortunate enough to go to school in Lawrence Township which has one of the best Performance Arts systems in the country. He studied percussion in classical music, concert band, jazz, was the drummer in the school pep band, and was a Bands of America National Champion in marching band. The pursuit of musical studies continued and he received a college degree in Music Theory and History. He has gone on to pursue his career in the great music scene of Chicago, where through crazy circumstances, he met the members of Chicago Loud 9. He is a former Music Director at School of Rock where he instructed kids of all ages the skills and principles to rock on stage – and in life. Middle school band director by day, saxy performer by night; Tayiib Dauda is a multi-instrumentalist who specializes in everything woodwind. Tayiib grew up in Las Vegas and began performing the local scene while still in high school with his funk-based jam band. He then moved to Chicago where he received his B.A. in Music Education from VanderCook College of Music and later completed his Master’s Degree in Symphonic Conducting at Missouri State University in Springfield, MO. When he’s not playing tasty horn lines with cLOUD9, you may see him performing with various Jazz Big Bands throughout the Chicagoland area. Jordan Maier is an electric, upright, and synth bassist living in Chicago. He specializes in electric bass performance, but also works extensively in music arrangement and composition. Jordan became a musician for all the wrong reasons. Picking up his first instrument at 15, he was decidedly not a child prodigy. But he quickly realized that music was his life’s calling when, just months after learning about power chords, he found himself leading his own band. Did certain relationships suffer because Jordan was a bit of a slave driver in his power-mad adolescence? Yes. But he learned the virtues of a disciplined approach to both learning music and leading a group of sometimes-appreciative young men. He also became accustomed to the frustrations, disappointments, joys, and wonders that are part of the professional musician’s day-to-day life. Kevin found the violin through the Czardas bands of his grandmother’s Hungarian homeland. A third-generation musician, he got his start on stage with his father and grandparents playing American holiday music in ski resorts in their native Austria. He came to America via Los Angeles, where he spent years playing on soundtracks and studio projects across the musical spectrum in addition to regular gigs at the House of Blues. A veteran of Grammy Camp and the Dirt Red Brass Band (where he learned the virtue of amping his violin to louder than the rest of the band), he came to Chicago to escape the climatological monotony of the endless LA summer. He joined Chicago Loud 9 to fulfill his lifelong dream to mash up rock, funk, hip-hop, r&b, and especially J-rock (no, really) in one killer band.